Mike and I can’t thank you enough for the amazing job you and your staff did the night of our wedding at the RAA. The food was amazing. So many people complimented on how fresh and delicious it was. You and your team were gracious, professional and fun. We are so happy to have worked with you. Your enthusiasm, creativity and culinary genius made our wedding unforgettable and perfect. We could not have asked for anything more – hats off to the chef! You truly do amazing work. Thank you for giving us a wedding day of perfection (and full guests)! Elaine, myself and our entire family wanted to thank you, Debbie, Martha, Kathy and Evan for making John’s 70th birthday party a success. You and your staff were a welcome part in our home. The food was wonderful. The house was cleaner than I had left it. It was so organized. Everyone is so warm and friendly. They felt more like guests. 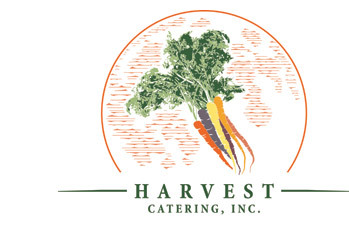 We look forward to including Harvest Catering for future entertaining. Thank you again. We just want to thank you for making our wedding celebration so fabulous. Our families and guests had a wonderful time and we were so pleased with the service, presentation and quality of food. We would highly recommend you to others. Hope all is well and Happy Holidays to you. We want to express how happy we were with the catering for Eric and Jesse’s wedding. Everything exceeded our expectations. Thank you for your contribution to a perfect day! I just wanted to thank you for all the time you put into my 10-10-10 wedding. Your generosity was amazing and we really felt confident as the day approached. Ellen and the gang did an amazing job! Everyone raved about the food, everything looked so beautiful and it was a spectacular evening. Thank you again for the cake board – it was perfect and the cake was beautiful and delicious. We will certainly recommend your company to everyone we meet! James and I wanted to thank you and your staff so much for helping to make our wedding day so special and wonderful. I really enjoyed working with you throughout the planning process and feel that you were crucial in helping the wedding become a reality. You and your staff did an absolutely wonderful job with the food, setting up the estate and the service! Our guests raved about how delicious the food was and how wonderful the servers were. The displays of the standing hors d-oeuvres looked beautiful as well. Thank you so much again – we would be thrilled to recommend your company to all our friends and family. The raves are still coming! When I was told initially that you were “flawless”, it contributed significantly in my decision-making process for Valerie and Jeff’s wedding reception this past September. Without question, your preparation, presentation and food quality were superb. I continue to marvel that you could prepare a meal for 160 people which was comparable in every way to the finest cuisine prepared for a party of eight! 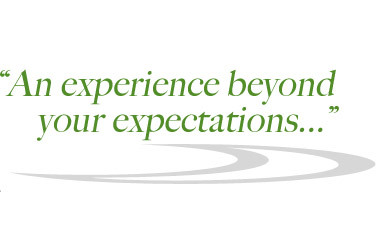 Your staff was professional, extremely pleasant, well-groomed and attentive to our guests. I did not have to opportunity to thank them personally for their part in making the day so memorable. I hope we have the opportunity to work with you again. Certainly I will refer clients to you as appropriate. You may use me as a reference if you would find that useful. Just a note of thanks for your kindness on several occasions at the Rockport Art Association. Your food is great! Jimmy and I would like to thank you for making our wedding day on September 3rd everything we ever wanted and dreamed of! The cascading cheese table was beautiful and the main courses were fabulous! Everyone commented on what a great job Harvest did! Not to mention your great wait staff! Thank them, as well. Thanks so much for all you did to make our wedding day so special. Cocktail hour was sensational and the guests haven’t stopped talking about the dinner. Your staff is great too – accommodating and friendly. One day in the future I would love to host a Christmas party at Glen Magna. I’ll be sure to call you – thanks again. You are terrific! We hired Harvest Catering for our wedding, and we could NOT have found anyone better! Don worked with us to put together a vegetarian and gluten-free menu - and EVERYONE was raving about the food!! He also worked with us to keep our costs to a minimum. I was extremely nervous about this reception, only to have my planner and the reception venue's event manager congratulate me on throwing a "high-end" wedding. THANK YOU DON! We hired Harvest Catering for our company Holiday Party. Donald and his staff did an exceptional job! They went above and beyond what we expected. The food was amazing and I have to say everything was perfect! It was a house party for 36 people. The staff was so attentive and friendly. Also, the price was great. We hired a corporate caterer last year, and we paid a lot more money, and although they were good, they can't compare to Harvest! We plan to use them again next year! From our first meeting with Donald, it was clear Harvest was going to be our wedding caterer. Getting married is stressful and having Donald on-board went a long way to keeping us sane. We had a below average budget, and he did a great job of putting a menu together that looked beautiful, tasted delicious and was within our limits. Donald has a bunch of tricks up his sleeve that made planning easy too, like event layout tools to quickly show us where we could place tables. He's also about the nicest guy you'll ever met! The food was terrific, his staff friendly and professional. Top notch company. Highly recommended. Harvest Catering did an outstanding job on our wedding and Donald was the icing on the cake. Low-key demeanor and outstanding taste in classic rock are just two things that I like about Donald that had nothing to do with the quality of food and service that Harvest was able to provide. My wife and I did about three tastings and selected Harvest based on a combination of food quality, value and first-hand meetings with Donald. In addition, he came highly recommended from the woman who manages the venue where we held our reception. The quality of food was terrific but, in addition, small details were not overlooked. My wife asked that her and her mom's steak be cooked well, and they were. Everything came out hot, quickly and on-time. Wait staff was extremely nice, professional and courteous. In addition, it was apparent that they clearly like working for Donald. We made special requests - such as a signature drink and an ice cream sundae bar that were accommodated with pizzazz. I asked Donald to get a specific topping from the Friendly Ice Cream chain, and he was all too happy to accommodate although he would have made it himself, had I asked for that. All in all, highly recommended and a perfect part of a perfect wedding day. Harvest Catering made my wedding perfect! Donald and his staff made the day seamless! People raved about the food for months after! Being Greek I needed to get lamb on the menu somewhere, but I know not everyone loves it as a meal so Donald suggested grilled lamb chops for an appetizer. They were out of this world! I highly recommend them for any event! 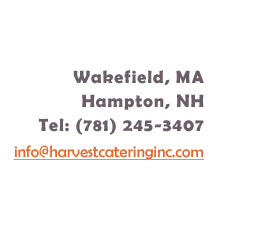 Harvest Catering was one of about six "Preferred Caterers" listed by our wedding reception venue. We visited most of them; however, after we met Donald we began to compare each caterer to what Harvest had to offer. When working on your budget, you'll quickly realize that your caterer gets a bulk of your $$$, it makes sense to put in the extra time to ensure you are getting what you want at a good value. Very professional and organized= my favorite traits in a vendor. Donald has these two qualities, not to mention, being incredibly patient and a good listener. He sat us down in his office on our first visit and asked what foods we liked and gave us some menu ideas. My husband and I wanted a delicious but healthy meal-- and, of course, to not break the bank on catering. After our meeting, Donald designed a menu proposal with his pricing quote. Working with Donald was like using a well-oiled machine. He's been in this business for a long time and knows what he's doing. He worked with us on our budget. We wanted a personal touch from our caterers and we feel we got this from Harvest Catering. Right before we decided to hire him, Donald gave us a tasting - he understands the importance of trying the product before spending loads of money, although he does want to ensure you are a serious potential customer before spending his money and time creating a delicious meal for you. It was a great meal and we drank wine and talked with him at length-- it was nice to also get to know a vendor, instead of working together as strangers. About two months before the wedding Donald and our wedding coordinator at the venue, met with us to go over some details. I have to say: every time I spoke to Donald, I always feel reassured and confident that everything was going to go smoothly at our reception. Donald also met with me on a weekend to view linen/napkin colors at a nearby party center. Once you walk down the aisle, believe me, you will no longer have control with what happens during the rest of your wedding day. It's a whirlwind of everything all at once. Donald and his staff managed everything very nicely. I am very pleased with how our reception turned out and everyone seemed to enjoy the food. We used Harvest Catering to cater a small in-home celebration with 10 people. We had appetizers and a sit-down dinner. The food and service were fantastic! Donald was great to work with ahead of time and on the day of our celebration. He and his server were very attentive and allowed us to enjoy our guests without worrying about any of the food or serving. Donald was also able to have appetizers ready when guests showed up earlier than expected. The kitchen was also left spotless when they were finished. I would definitely recommend them and would use them again. We used Harvest as our wedding caterer because we got married at a historic estate and were very strictly limited as to what vendors we could use. We ended up going with Harvest because they were moderately priced and the food was really really good. It's always been my perspective that dinner is the dullest part of a wedding. So we decided to skip dinner and have a constant stream of passing hors d'oeuvres as well as standing ones (and the presentations were lovely). Also, at the wedding itself, the even coordinator (who did a fantastic job in general, she was a lifesaver when it came to figuring out when to do the first dance or cut the cake - as our wedding was all DIY and we didn't have a planner, or sometimes a clue) was sweet enough to leave a plate of fruits and veggies in my changing room so I had something to snack on while going through the whole "holy crap I'm getting married!" routine. Maybe some Klonopin would've been good since waiting to get married is surprisingly stressy, but the nice fruits, veggies, and water helped a ton, plus I wasn't all stoned for the big event. They also do corporate events as well as private parties. Also, they did a great job recommending a bar tender/liquor service for the event, as again we were highly restricted on vendors due to the location of our event. Harvest catering did our wedding at the Lyman Estate. Don is a true professional and a good guy. His organization was first rate. He made lots of helpful tips and suggestions to us when we were planning. The fact that he had catered at the Lyman before meant that he knew what would work and what wouldn't. The appetizers were excellent and main courses (salmon and filet) got lots of compliments as they were delicious. Even when there was a mistake at one of the tables with 2 few place servings - which was totally my fault - we told Don and his team, and they fixed it on the fly in 2 minutes. Don is like a machine - I was just really impressed and I would not hesitate to recommend him to anyone who wants their wedding catering to be done perfectly. 5 stars! Excellent, excellent, excellent!!! The food was amazing. The service was excellent. Donald and his crew did a fantastic job at my wedding! I honestly couldn't have asked for more. 100% satisfied!!! So many guests commented on how wonderful all of the food tasted. We chose buffet style and the food choices Harvest Catering has is wonderful. We were able to pick out exactly what we wanted. Everything was cooked perfectly, tasted amazing, and looked spectacular on the plate! Donald goes above and beyond to make sure that everything is how you want it. I had a vision and he made it come to life!! Thank you a million times!!! We used Harvest Catering for our wedding and couldn't have been happier. From the beginning Donald (owner) was extremely helpful in helping us plan the evening. He always returned our calls promptly and was very forgiving when, due to a miscommunication, we missed our tastings...twice. In the place of a traditional sit-down meal we had heavy hors d’ouvres and a food station. I was concerned that I would be paying lots of money for Costco appetizers on fancy platters. But at our tasting I discovered how wrong I was. Every dish was homemade, from the tenderloin, to the crab cakes, to all of the sauces. Our guests raved about the food even days after the wedding was over. Donald was on time with delivery and set up, his staff was very professional and well organized, and he was always present to help coordinate the events of the evening. He even sent home all the left overs with my bridesmaids. Compared to other companies we spoke with, pricing was very reasonable. I would absolutely recommend Harvest Catering to anyone who needs food for their events! Donald and his team at Harvest Catering catered the cocktail hour and seated dinner at my wedding recently and they were fantastic! We heard from a few guests that it was the best wedding meal they'd ever had. The shrimp and swordfish skewers were my favorite and the delicious grilled entrees fit in perfectly with the coastal setting and spring feel. We enjoyed working with Donald from the start and he was always professional, organized, and easy going. I highly recommend Harvest as a wedding caterer! I used Harvest Catering for my wedding in November, and I can't recommend them enough. Not only was the food exceptional, Don is the kind of person that would do literally anything to make sure that your day is special. Don has been in the wedding business for a long time, and he was able to make suggestions that made the evening even better than we had anticipated. As far as catering goes, the pricing was very reasonable, and you get what you pay for. My guests told me that the food was the best wedding-food they have ever had. And the icing on the cake (so to speak) is Don's staff. They were professional and friendly the entire night. I would definitely, definitely recommend Harvest. They were truly a pleasure to work with!